Indie Swatch Spam - Polish This! I have a quite big swatch spam post for you guys today. I have total of five different polishes to share with you guys from five different brands: Cadillacquer, Cirque, Delush Polish, Glam Polish and Powder Perfect. The first one is Cadillacquer Say My Name and this one is from Cadillacquers Breaking Bad collection, so it's just a bit older one already. It's a beautiful brownish purple with strong blue shimmer and scattered holographic effect. The holo effect didn't really show up too much in my swatches as I had to do these in my light box, but the polish is really pretty nonetheless. I used two coats here, no base or top coat. 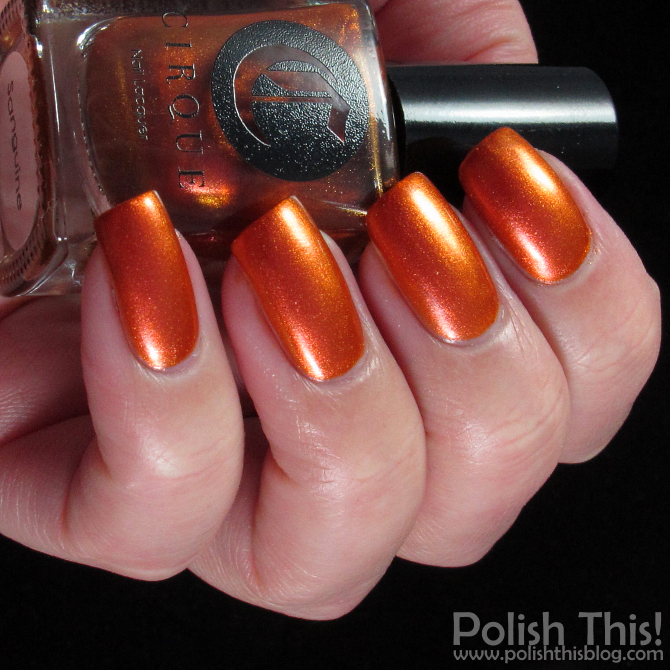 Cirque Sanguine is a stunning orange-gold duochrome that shifts to coral. The color shift isn't too obvious with this one but it's still there and you can see it at least a bit in my pictures too. I really love this color, but unfortunately this was really sheer so I had to use four coats to get a full coverage and that's just way too much for me. I can do three, but I know that if a polish needs more than three, I will never use it as I just don't have the time and patience to do so many coats. Though of course this can be fixed, so I highly recommend wearing this over a similar base color, so you don't need so many coats. Also, this would certainly look cool over some burnt red or even black! Delush Polish Teal Death Do Us Part is from the Bombastic Summer Love collection and it's has a beautiful minty teal base with gold, pink, teal and lavender glitters. The base is quite opaque, so it covers those glitters quite a bit if you do two or more coats. I did three here with top coat, but you can get by with just two coats. If you want those glitters to pop up more, you can always layer this over similar base color. The biggest hexes took a bit fishing, but they were still fairly easy to get on nails. This beauty is Glam Polish Infinite Wisdom from Exotic Illusions May Trio. It's a teal-ish emerald filled with green and gold shimmer flecks and with a soft holo effect. Again the holo effect doesn't really show up too much in my pictures, but it's still there. It's probably no surprise that I loved this one since the color is right up my alley and it's a gorgeous shimmer/holographic. I used three coats here, no base or top coat. Last but not least I have Powder Perfect Faded Jeans, which I used as a base for my Bones nail art, but I still wanted to share my swatches of it too. It's a beautiful grey crelly with a mix multicolor fine glitter. There's at least pink, blue, gold and silver in there. This is quite unique grey and the base is just rightly pigmented as you can still see those glitters but it also coveres pretty well. I used three thin coats here with a coat of top coat. Oh and by the way, the challenge starts tomorrow! I'm so excited that I took a little head start and did my first mani already yesterday. I can't wait to share it with you tomorrow and I really hope to see many of you participating too! I'll see you here tomorrow and if you don't know what challenge I'm talking about, take a look at this post. So tell me, which one of these is your favorite? Wow I definitely love Delush, Cirque and Glam Polish! Goooorgeous! I am eyeing on that Delush one. So pretttty!!!! !